Mark your calendars! 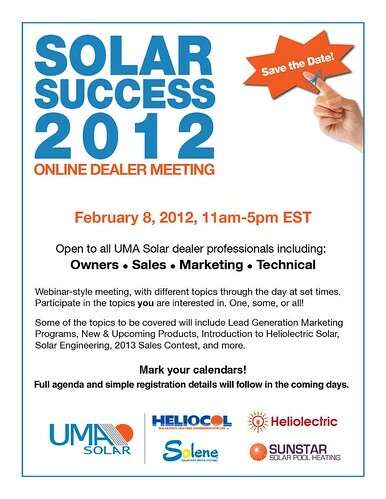 UMA Solar's 2012 online dealer meeting is scheduled for February 8, 2012. For the first time ever, our annual meeting will be open to all UMA Solar dealer professionals including: owners, sales, marketing and technical personnel. This webinar-style meeting will offer a variety of different topics throughout the day at set times. Choose the topics that interest you! A full agenda and registration details will be available soon. One Block Off the Grid, a community solar group, is offering a unique rebate program to Arizona homeowners. The rebate is offered to participants based on the total number of Arizona households that go solar within a 90-day period. The group will credit each eligible Arizona household with $100 in a community chest account. Each time an eligible homeowner goes solar in the Grand Canyon state, the company will add an additional $10 to each account. At the end of the three-month program, homeowners who purchase or lease solar panels will receive a solar rebate check from the community chest. The rebate offer is available to homes in the greater metro areas of Phoenix, Tucson, Glendale, Scottsdale, Chandler, Gilbert, Peoria, Mesa and Sierra Vista. One Block Off the Grid, which calls itself the Groupon of solar, says its membership has grown 98.4 percent in the past two years due to the increase of utility bills and major outages this past September. The Marin Energy Authority is offering a $500 solar rebate to customers who purchase their electricity from the authority. The $500 rebate is available to customers who install a solar photovoltaic system in Marin County, California of at least 1/2 kilowatt in size. Customers will be required to fill out a form verifying that the solar panels were purchased on or after Dec. 11, 2011. Marin Clean Energy currently serves 13,000 customers. More than 400 of those customers have already installed solar systems on their roofs. Marin Clean Energy expects the rebates to incentivize not only the installation of new solar projects but also the expansion of existing solar projects which would increase renewable power flow onto the electric grid. 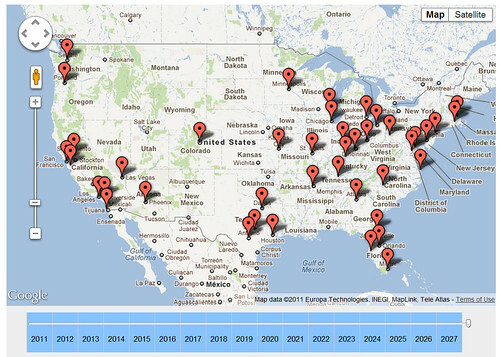 A new animated map, published on the Energy Self-Reliant States website, predicts which U.S. cities can achieve solar grid parity first. Grid parity describes the moment when electricity from solar power is less costly than electricity from the existing grid. Energy policy analyst John Farrell predicts San Diego will be the first city to achieve grid parity in 2013, followed by New York City in 2015. By 2027, Farrell surmises that more than 40 metropolitan areas nationwide will reach grid parity. Farrell based his projections on current decreases in the cost of solar electricity and increases in grid electricity rates. Rhone Resch, president and CEO of the Solar Energy Industries Association, recently published this review of the U.S. solar energy market in 2011, including what he called seven truths about the American solar industry. 1. Solyndra did not kill the industry. In fact, the solar energy industry is expanding rapidly and has become a highly competitive, thriving industry in the United States. Solyndra’s high-profile bankruptcy in August was an anomaly in what proved to be the industry’s most successful quarter on record. Although Solyndra couldn’t compete, the rest of the industry grew by 140 percent in the last year and costs came down by 40 percent. America discovered that one company’s failure does not reflect an entire industry. In fact, 9 out of 10 Americans feel it’s important to develop and use more solar in the U.S., according to an independent national poll conducted a month after Solyndra declared bankruptcy. 2. Today, U.S. solar is an economic force: employing more than 100,000 Americans at 5,000 businesses across all 50 states. The solar industry proved itself to be a strong job creator in the United States. The vast majority of the 5,000 companies that make up the industry in the U.S. are small businesses, engines of growth for our economic recovery. These are real people in real solar jobs as reported by The Solar Foundation’s National Solar Jobs Census 2011. The solar value chain includes engineers, sales people and other administrative professionals as well installers, roofers, electricians, plumbers and contractors – skilled labor professions hit hard by rampant unemployment in recent years – now finding new opportunities to put their expertise to work in the solar industry. 3. The solar industry is one of the fastest growing sectors in our economy.The solar industry set a record for installations and achieved 140 percent annual growth in thethird quarter of 2011. In fact, more U.S. solar electric capacity came online in Q3 2011 than in all of 2009 combined; Q4 2011 is forecast to be even larger as solar becomes a cost competitive choice for more homeowners and businesses across America. 4. Consumer, business and industry support for solar continues to grow. Solar’s growth is leading to rapid innovation across the spectrum – from factory improvements to new financing and sales mechanisms – that allow more and more Americans to turn to solar energy. Target, Walgreens, Whole Foods, Johnson & Johnson, Safeway and others are powering their businesses with solar. In addition to GE’s investment in new manufacturing in the U.S., 2011 also welcomed new household-name corporations to the solar industry, with Warren Buffett’s MidAmerica Energy, Total Energy and Google all making sizeable investments in solar in 2011. 5. Solar is now affordable for more Americans. Today, there are 1.5 million households using solar water heating and enough solar electricity to power 730,000 homes. And solar is becoming more affordable every day with technology innovation, scaled up manufacturing, faster installation techniques, and new financing options. The price of solar panels dropped 40 percent since the beginning of 2010 and the average installed system price ropped 14.4 percent from Q2 to Q3 in 2011 alone. 6. Growing markets bring increased competition. Global trade in solar products has benefitted the United States by expanding export opportunities for domestic manufacturers, creating jobs and driving down costs. In fact, the U.S. was a net exporter of $2 billion in solar products in 2010. As global competition intensifies, the need is even stronger for open markets operating on rules-based trade principles and for governments and private parties to follow the framework of internationally-negotiated trade rules. 7. Uncertainty remains as a successful investment mechanism expires. Congress left Washington, D.C. without continuing the important 1603 Treasury Program, a program that provides flexibility in how developers finance projects. This program, which allows the market to choose winners and losers, was the single most effective policy for deploying a dozen energy technologies in the last year. The program has spurred completion of more than 22,000 energy projects across all 50 states and attracted $23 billion in private investment. The industry will push to renew this successful program when Congress returns in January 2012. Looking for a job in the solar industry? A new online tool makes it easier than ever to explore great solar career opportunities. Developed by the Interstate Renewable Energy Council (IREC) as part of the Department of Energy's Solar Instructor Training Network, the new interactive solar career map website maps three dozen solar jobs across four sectors: production, design, sales and marketing, and installation/operations. According to the IREC website, a team of national experts selected the 36 occupations within the map. Each job requires some training in solar-specific skills and each is essential to building a thriving solar industry, the IREC said. Visit the IREC information page outlining the map for more information, including an informative video. Are you a wrap star? What are your eco-smart gift wrapping techniques? Here are six budget-friendly green wrapping tips. Plain brown paper bags or brown shipping paper looks beautifully natural when tied with twine and decorated with pine cones or evergreen sprigs. Remnants of wallpaper or fabric you might have leftover from a home decor project makes a great statement while repurposing those scraps. Recycled aluminum foil looks sparkly and festive and is perfect for those odd-shaped gifts. Old newspapers and magazines can wrap your gifts for one last use before being recycled. This technique is an oldie, but a goodie, and you can choose the section according to your recipient's tastes. Old roadmaps make a colorful graphic statement when used as wrapping paper. Who uses those old maps anyway in the age of GPS devices? Many stores offer holiday-themed reusable shopping bags this year. They make a great gift bag that can be used repeatedly for shopping after the holidays. Solar energy is the ultimate renewable energy option! 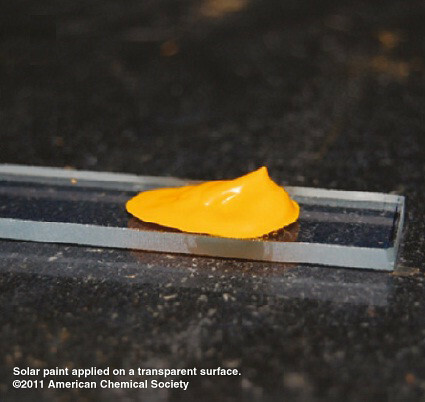 Using solar energy results in lower greenhouse gases, reduced acid rain and lower smog levels. The use of fossil fuels strains not only our environment, but our independence as a nation. Reduce dependence on foreign oil by taking advantage of clean, unlimited, solar energy. According to the Sierra Club, power plants contribute to 600,000 asthma attacks each year. Solar panels provide Americans with clean, harmless energy. 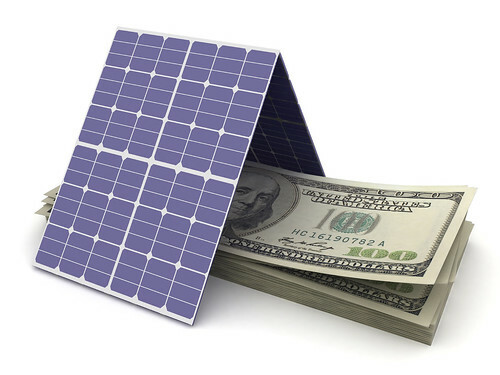 Solar energy is free, after the initial purchase cost of your solar system. 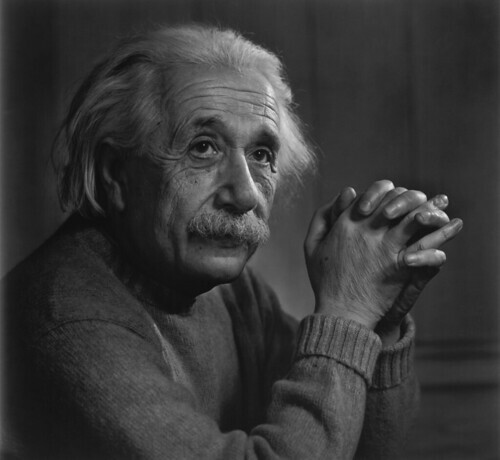 Years from now, the solar energy you collect at your home or business will still be free. According to the U.S. Department of Energy, a solar energy system may add $10 to $20 to your home’s worth for every dollar in energy costs saved in one year. For example, a system that reduces energy costs by $500 per year might add $5,000 to $10,000 to the home’s value. In addition, solar panels can help extend the life of your roof by protecting it from ultraviolet rays and weather. Investing in solar energy is an important step toward leaving the next generation with a safer, cleaner world. According to the Solar Energy Industries Association (SEIA), the solar industry employs about 60,000 Americans. By 2016, SEIA predicts that increased demand for residential and commercial solar installations will add hundreds of thousands of U.S. jobs in research and development, manufacturing, construction, sales and marketing, and other fields. Give the gift of green this holiday season and avoid the dreaded "no batteries included" clause with these solar-powered gift suggestions from UMA Solar. All the festive charm of traditional holiday lights without paying the traditional electric bill! Most solar-powered holiday lights use LEDs which run cooler and shine brighter than incandescent lights. Not only will they last longer, there is less risk of fire from overheating. Best of all, you won't have to worry about extension cords! Convert an existing backpack or messenger bag into a solar-powered super bag with a Piggyback Solar-Powered Gadget bag from ThinkGeek . The charger includes two pouches, big enough for computer tablets and e-readers, plus built-in channels for running USB cables between pouches. The Logitech K750 wireless solar keyboard charges itself in any kind of light, artificial or sunlight, and will stay charged for up to three months in total darkness! Just 1/3" thick, the keyboard features sleek lines and portability, perfect indoors and on the go. Let the music move you, wherever you are. The portable Soulra XL solar-powered boom box features a flip-out solar panel. The panel allows you to charge your mp3 player or smart phone while listening to music through its eight speaker drivers (two tweeters, two woofers and four passive radiators). The Husqvarna hybrid automatic lawnmower comes with a large integrated solar panel that allows the mower to extend its cutting periods before it needs charging. Best of all, you can leave it to cut your lawn while you sit back with a cold glass of lemonade. The fully automatic robotic mower will happily graze your lawn, return to its charging station when power is low, and send you a text message if anything goes wrong. A gift for the entire family that keeps giving, a solar pool heater by Heliocol or SunStar will double the swim season in any climate. Enjoy a resort lifestyle in your own backyard! Heliocol and SunStar solar pool heating systems are maintenance-free and work with your existing pool pump, providing you with free heat from the sun. For the eco-concious kiddies on your list, consider a solar-powered robot. The 3-in-1 Transforming Solar Robot not only teaches kids about solar energy, it transforms from a robot to a tank to a scorpion! The Solio BOLT is a slick little charger that also works as a battery back-up for your smartphone, mp3 player, e-reader, GPS or camera. Just connect to the BOLT using your device's own USB cable. The BOLT holds a charge for up to a year and gives most smartphones more than two charges! Gov. Jerry Brown recently set a goal for state utility companies to derive 33 percent of their energy from renewable sources by 2020. Here in the land of sunshine, it just makes sense for homeowners to get a head start on the energy companies by finding opportunities to use solar energy now, especially outdoors. Solar outdoor lights appeared on the market several years ago, offering "free lighting" that's a cinch to install. Simply put them in a sunny location, and they do their thing. No cords, no trenching, no inverters. And if you pick the wrong spot or find you need more light in a different location, just pick them up and move them. Sounds perfect, and they would be if only they produced a quality light and had a long battery life. "There are no solar [lights] that are worth the dirt they are staked into," says Mark McAnelly, owner of highly rated Southwest Landscape in San Diego. McAnelly says the current generation of outdoor solar lights acts more like markers to illuminate a driveway like a runway. On the other hand, solar pool heaters are impressive, says Steve Jacobs of highly rated Nature Designs Landscaping in Vista, Calif. These simple systems pump water from the pool into solar panels, where the sun heats the water before it circulates back into the pool. Jacobs likes Heliocol solar systems because of their reliability and low maintenance. The solar panels are best mounted on a south-facing roof or slope at ground level, providing there are no trees or nearby buildings to shade them. As a rule of thumb, solar panels cover roughly the same square footage as the pool, though in cooler coastal areas, they might be 25 to 50 percent larger; in desert areas, 25 percent smaller. Heating also determines the size. In Southern California, systems are typically designed to heat water to 85 degrees in summer, 65 degrees in winter. Warmer water requires more panels. Whatever the size, Jacobs says, they commonly install solar panels on roofs because of space. Most lots aren't big enough to put them at ground level. Weight isn't usually a problem for the roof, as a small volume of water moves through the panel at a time. Tod Ellington, director of marketing at UMA Solar, Heliocol's parent company, says his systems can double the swim season. "In Southern California, you can get an additional six or seven months." Solar heaters cost two or three times more than natural gas or propane with the average sized system priced around $5,000, but recouping the investment can take less than five years. "Some people can spend $800 a month trying to heat their pools with gas," Jacobs says. "At that rate, payback would only be only a year or two." The longevity of solar systems is also impressive. Heliocol's warranty is 12 years, including labor, mounting hardware and panel connections with some systems working well past 20 years, according to Ellington. Nan Sterman is author of "California Gardener's Guide Volume II." She's a gardening expert, communicator and designer who has long grown an organic garden of plants that both feed her family and beautify her yard. The Wall Street Journal wants to know: What should happen with U.S. government subsidies of renewable energy development? Share your opinion by submitting an answer to this poll at http://ow.ly/4xVtW. The New York Energy Research and Development Authority is offering $25 million over the next five years to promote solar hot water system conversion. The program provides incentives of up to $4,000 per eligible residential site and up to $25,000 per eligible commercial and non-profit site. Customers must currently use electricity to produce hot water. State Agricultural Commissioner Darrel Aubertine is encouraging farms with electric hot water systems to apply for the incentives for solar thermal systems. Dairy farms, in particular, use a significant amount of hot water daily to sanitize milking equipment. By combining federal and state tax incentives with the new program, incentives are expected to cover 70 to 75 percent of installed costs. Visit http://www.nyserda.org/funding/2149pon.asp for more information and to apply. Universities in Connecticut and North Carolina will develop special labs to test solar thermal products, addressing the current shortfall in available testing services in the U.S.
North Carolina State University is scheduled to open its special solar thermal products testing lab in late 2011, while the University of New Haven plans to open its lab in 2012. Currently, only five U.S. labs are accredited to test the products, causing delays in the certifications that are required for tax credit eligibility. UMA Solar will be exhibiting at the Orlando Pool & Spa Show February 11-12, 2011 at the Orange County Convention Center in Orlando. Please stop by and visit us at booth #224. The Orlando Pool & Spa Show is the premier event of the swimming pool industry in the southeastern United States. The annual event attracts thousands of industry professionals from all over the United States as well as the Caribbean. The show features new products, networking opportunities, excellent education courses and opportunities to meet directly with manufacturers. Jimmy Lupien, UMA Solar national logistics manager, recently relocated to the UMA Solar warehouse and distribution center in southern California. “While this move has been challenging, it has also been very rewarding,” said Lupien. “Meeting some of our West coast partners has already given me a sense of being at home. UMA Solar has such a wide variety of products to offer that it only makes sense that the southern California market would be one of the many distribution areas that UMA wants to call home. What is the best way to prevent scalding in solar water heating systems? As solar contractors we must be diligent when designing solar water heating systems. I have witnessed many systems over the years where storage tank temperatures have exceeded 165°F in the summer and the customer had not left on vacation. Although we want temperatures to be high enough to destroy bacteria (specifically Legionella bacteria), we do not want to cause scalding burns to small children, elderly or handicapped clients. Many experts recommend turning water heater thermostats down to 120°F to reduce the risk but unfortunately this puts your storage tank right at the high range for breeding Legionella. Of course turning the thermostat down on a solar system only shuts the back-up element or burner off at 120°, it does not stop the solar from continuing to heat the water unless you have a differential control and set the high limit switch to cut out at a specified temperature. Therefore, here is the dilemma, let the water get hot enough in the tank to kill bacteria or set it down to protect the vulnerable. Join UMA Solar in recognizing 2010’s employees of the year: Loren Zuconni, sales; Dave Colon, warehouse supervisor; and Thomas Colon, warehouse employee. UMA Solar CEO Victor Eyal recognized the employees at a recent luncheon, commending them for their service and dedication throughout the year. Surviving 2010 while maintaining a level of activity that is consistent with the last two years is an outstanding accomplishment and I thank you, our dear colleagues, for making that happen. Considering the economical environment on the negative side, and the solar and renewable environment on the positive, I have no doubt that 2011 is going to be a year of growth. Our sales and marketing departments have been busy making your communication lines with us smooth and open. In addition to providing the best service possible, we have insisted on supplying every one of our colleagues, customers and clients with the lowest prices for the best products available in the solar industry. Additionally, we will be issuing a printed price list for your convenience. You will now have the pricing and availability of our products at your fingertips at all times. The internet is a time burglar and I know that many of us spend a long time in front of the computer screen. Our IT and computer staff has been at work to make your use of www.umasolar.com easy by having one password for all functions and by making everything available electronically. Take your time to explore our websites. 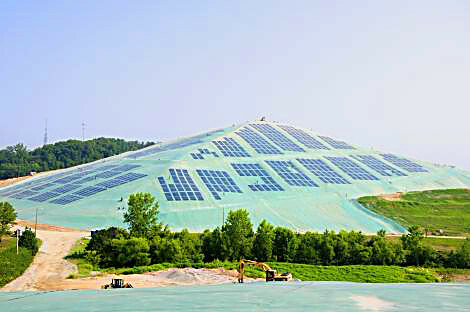 Not only www.umasolar.com, but also the specific products sites of Heliocol, Solene, MyGen and SunStar. There is a wealth of information in the dealer section behind the password and you will benefit greatly from digging into all corners of our websites. Lastly, our slogan of “one-stop solar shop” has become our mission statement in 2011 and I pledge to carry every item that will make your solar business activities more streamlined and efficient. Challenge us and share all your solar needs so that you can rely upon UMA Solar as your one-stop solar shop. Thank you for your continued support, loyalty and cooperation. I wish you a successful year of growth. Recent expansions within UMA Solar’s engineering department include new licensure and new personnel. UMA Solar Senior Engineer Michael Studney, PE, has expanded his professional engineer licensure to include the state of North Carolina. 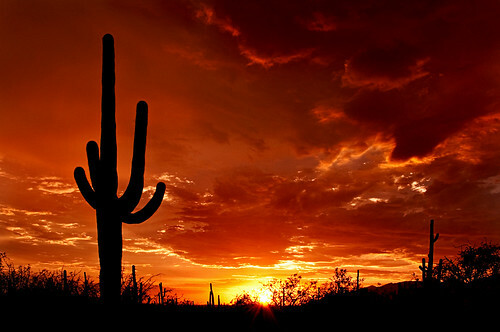 Studney already holds professional engineer licenses in Texas, Arizona and Florida. The additional licensing is part of UMA Solar’s ongoing effort to provide solar engineering services to its family of partners throughout the nation. In addition, Chris Meyers, CAD specialist, has joined the UMA Solar engineering team. In early August 2010, Heliocol partners and sales teams throughout the United States gathered for a four-day, fun-filled retreat in Cabo San Lucas, Mexico. The Heliocol retreat was designed as a reward for top performing Heliocol partners and their sales personnel. The main purpose of the trip was for fun and relaxation, with a bit of time set aside for business. Heliocol partners had the opportunity to schedule one-on-one meetings with UMA Solar’s executive staff to offer feedback, suggestions and constructive criticism. But the bulk of the four-day retreat was spent swimming, scuba diving, parasailing, fishing, drinking and eating—a great time for all involved! UMA Solar will be stationed at booth #:2457 throughout the duration of the Atlantic City Pool & Spa Show at the Atlantic City Convention Center. Be sure to visit and meet with our staff for information on our innovative pool heating products. The Atlantic City Pool & Spa Show Jan. 25-27 will feature more than 550 exhibitors and more than 10,000 pool and spa professionals are expected to be in attendance. Extreme Makeover: Home Edition, the Emmy®-award winning, hit reality show on ABC Television, will feature UMA Solar’s Solene™ brand solar hot water system in their newest monumental effort—a new, fully custom, net-zero energy home in Melbourne, Fla.
UMA Solar donated a Solene™ Solar Hot Water System featuring two Aurora panels with a 120 gallon water tank. The system will save the family an estimated $750 per year. Solar Energy Systems of Brevard, an exclusive partner with UMA Solar, will install the system. A live view of the ongoing construction can be viewed at http://solene.com. “When we were approached about this project, we jumped at the chance to help,” said UMA Solar’s Director of Marketing Tod Ellington. “Assisting this special family and sharing the value of solar technology with the Extreme Makeover audience is a win-win opportunity for everyone”. The Hurston family of Cocoa, Fla. will live in the home. Their previous home and belongings were destroyed by a burst water pipe while the family was away on a charitable relief effort. The 3,400-square-foot home, currently under construction by LifeStyle Homes of Melbourne, will include a wide array of green innovations including solar hot water, solar electric, energy saving insulation and building materials, LED lights and a high-efficiency heat and air conditioning unit. As a net-zero home, the house will produce all the energy it requires, saving the homeowners hundreds of dollars each month. As reported in Solar Thermal Magazine. Eighteen cities and towns in Massachusetts have been designated Green Communities, making them eligible for over $3.6 million in grants for local renewable power and energy-efficiency projects that will advance both municipal and state clean energy goals. Boston, Dedham, Easton, Gardner, Gloucester, Harvard, Hatfield, Marlborough, Medway, Milton, Newburyport, New Salem, Scituate, Swampscott, Watertown, Wayland, Williamstown and Winchester join 35 other cities and towns named in the inaugural round of Green Communities designations last May – bringing the total number of official Green Communities to 53. - Requiring all new residential construction over 3,000 square feet and all new commercial and industrial real estate construction to reduce lifecycle energy costs. Newly designated communities have until Jan. 21 to submit applications for grants that will be awarded later this winter. 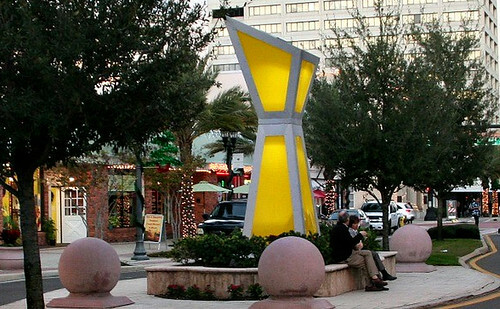 DOER will take additional applications for Green Community designations and grants later in 2011.